The Rooftops do not run all the roofs in Paris but more and more Parisian bars are inspired by New York fashion and we find more and more rooftops rooftops with a magnificent view of the capital around Paris. ‘a glass. What are the Parisian rooftops to miss under any circumstances? 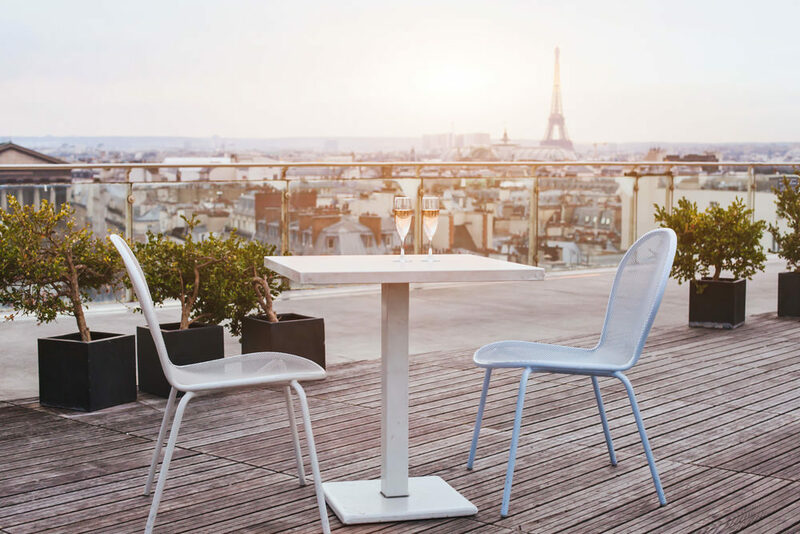 The rooftop Paris Mama Shelter in the 20th arrondissement is a colorful place with its banquettes and parasols printed with a table football and a ping-pong table where you can bask as on the beach. This place is open from 10am to 19pm from Monday to Friday. The perch of the marsh at the top of the BHV houses under its 250 square meters of seat terrace wood to enjoy the summer time. You will also enjoy guacamole and other charcuterie. This place is open Monday to Saturday from 8pm to 2am (9pm Saturday). The Perchoir de l’Est is on the rooftops of the station Gare de l’Est and offers a magnificent view of the 10thneighborhood. It is open from Monday to Friday from 18h to 2H and from 16H to 2H on weekends. The rooftop Communion (formerly Nuba) is located on the rooftop of the City of Fashion and Design in the 13th neighborhood. You will enjoy a musical program at the top and a street food to share everything under the stars and overlooking the Seine! The rooftop of the lounge bar view in the 15th neighborhood on the rooftops of a Novotel hotel is rather sober and quiet with tables and low armchairs overlooking the Effel Tower and open daily from 5pm to midnight. During your stay in Paris, make a reservation at our Aloha youth hostel located in the 15th neighborhood.